Along with the industry, many universities too received grants for their research work in biofuels. The US is looking to develop and commercialize biofuels, to create economic opportunities for rural communities and reduce dependence on foreign oil. WASHINGTON DC, US: THE US Department of Energy and Department of Agriculture have jointly awarded $ 47 million in grants to eight R&D projects developing biofuels, bioenergy and products from biomass. The projects winning the grants, to be funded through the Biomass Research and Development Initiative, were announced by US Energy Secretary Dr Steven Chu and US Agriculture Secretary Tom Vilsack, following a competitive selection process. It is hoped that the projects will eventually lead to a number of benefits, including reducing US oil imports, job creation, supporting rural economic development and protecting consumers from global gas price spikes. Hawaii-based Cellana received $5,521,173 to develop a protein supplement for livestock from algae produced as a by-product of the biofuels industry. A grant of $7m was awarded to Domtar Paper Company to build a demonstration plant to convert waste products from paper mills into sugar, oil and lignin products. A project by Metabolix, a bioscience company based in Massachusetts, to increase the yield of bio-based products, power and fuels made from switchgrass, was awarded just over $6,000,001. Another project being conducted by the University of Kentucky, has received $ 6,932,786 to demonstrate the use of on-farm processing of biomass to make butanol, ethanol, acetone and organic acids, which can subsequently be transported to biorefineries for further processing. Researchers from many disciplines will be involved, including chemical engineers, plant and soil scientists, horticulturalists and economists. The genetic traits of sweet sorghum, which make it tolerant to drought, are being studied by the University of Florida. The university has been awarded $ 5,430,439 to select strains that produce high biomass yields and are easy to convert into fermentable sugars. The University of Kansas Centre for Research has received $ 5,635,858 to demonstrate, at a pilot scale, a novel technology to produce bio-based advanced fuels, industrial chemicals and chemical intermediates. "The projects will help produce affordable, renewable biofuels to power cars and trucks. President Obama set a bold national goal to reduce America's oil imports by one third in a little more than a decade. By developing and commercialising advanced biofuels, we will create new economic opportunities for rural communities, provide consumers with new options to fuel their vehicles and reduce our dependence on foreign oil," said Chu. The recipient is honoured for revolutionizing NMR spectroscopy, which forms a critical research tool central to many scientific discoveries. Dr Waugh has received $ 300,000 for further research in NMR. BOSTON, US: Many of the past half century's discoveries in chemistry, physics, biology and materials science flow in part from John S Waugh's pioneering work in nuclear magnetic resonance. His theoretical and experimental breakthroughs revolutionized the field of NMR spectroscopy one of science's most powerful and widely used research tools. The Welch Foundation honoured Dr Waugh with the $ 300,000 Welch Award in Chemistry for his contributions to basic research that benefits humankind. "Dr Waugh discovered how to use NMR to study solids, creating a collection of tools that allows researchers to view the structures and properties of proteins, membranes, viruses and many other critical components of life. Ultimately, new applications in fields as diverse as medicine and batteries can trace their way back to the research techniques he initiated," said Ernest Cockrell, Chair of The Welch Foundation. Dr Waugh and his students discovered and developed the fundamental methods that extended the application of high resolution NMR to solids. Today this method is used in both solid and liquid NMR experiments. In 1973, Dr Waugh's group solved another major problem limiting NMR aplications with a cross polarization/decoupling method that greatly increased the detectability of rare nuclei, such as carbon-13. "NMR spectroscopy continues to profoundly influence the way we do science. He took what was a useful tool for studying small molecules in solution and greatly expanded its possible applications to a range of solid materials that can't be studied effectively by any other method," said James Kinsey, Chair of The Welch Foundation's Scientific Advisory Board. Dr Waugh earned his PhD at the California Institute of Technology. And in 1997, Dr Waugh retired from MIT, but maintains an office and pursues interest in exploring fundamental physical questions via computer. "It is wonderful to be recognized by The Welch Foundation for doing what I love. When I started out in NMR years ago, little did I know that I would still be writing and thinking about it more than a half century later. I have had the special joy of helping pioneer an entirely new area of science and creating a collection of tools that other researchers continue to build upon," said Dr Waugh. Research councils are set to research ways of extracting valuable chemicals from co-products of grain brewing. This will help find ways to process the by-products to yield chemicals sustainably that are usually produced from fossil fuels. SWINDON, UNITED KINGDOM: A collaboration between BBSRC, EPSRC and industry recently announced new funding for research into ways of extracting valuable chemicals from the co-products of grain brewing. The refining of both alcohol and biofuels produces low-value derivatives that are often sold as animal feed. This new funding call will challenge researchers to find ways of processing these by-products to yield chemicals sustainably that would otherwise have to be produced from fossil fuels. The investment forms part of the Integrated Biorefining Technologies Initiative (IBTI) club, a Biotechnology and Biological Sciences Research Council (BBSRC) - led partnership with Engineering and Physical Sciences Research Council (EPSRC) and industry. This final round of funding will cap off over £ 5 million of investment that the club has made into biorefining over the past three years. The IBTI club aims to support biorefining in the UK by finding ways of overcoming existing bottlenecks or by finding new methods for enhancing the value of current products. This research will help to develop a commercially competitive biorefining industry in the UK which will be vital in order to help us meet our renewables targets and reduce dependency on fossil fuels. Previous projects funded by the IBTI club include research into deriving new flavourings, antioxidants and valuable aromatic chemicals from indigestible parts of plants. This call will draw on the expertise of a range of scientists from engineers to microbiologists to make the best use of a side-product which will become increasingly abundant in the UK as more bioethanol plants come on line. "As fossil fuel resources are depleted we will need to find new ways of not only fuelling our vehicles and power stations, but also producing our plastics and other vital industrial chemicals. Plant matter is going to be an important source for replacing these carbon-based products and it is crucial that scientific expertise is encouraged to help industry to do this and in a way that is sustainable and economically viable," said Dr Celia Caulcott, Director of Innovation and Skills, BBSRC. The academia and industry joint venture will explore how to extract value from tree bark, a forest residue of the lumber industry. Previous research indicates that incorporating bark products into other polymers can result in improved properties. EVERBERG, BELGIUM: Huntsman Polyurethanes has been invited to join the Bark Biorefinery Consortium Project, a four-year joint venture between academia and industry that is exploring how best to extract value from tree bark that is a forest residue left over by the lumber industry.The collaborative research programme has a total budget of CAD $ 5.25 million and is being funded by the Province of Ontario together with participating institutions and industry partners. As part of consortium activities, representatives from Huntsman's CoreScience unit in the United States will work closely with scientists from the University of Toronto, who are leading the project. Huntsman team will focus on one core element of the initiative: converting bark into value added intermediates for polyurethane to achieve improved properties and more renewable content. Previous research in this area has shown that incorporating bark products into other polymers can result in improved thermal stability and fire resistance, as well as improved adhesive properties. "Next generation bark-based additives are expected to further advance green developments in the polyurethane industry. We are delighted to be working with Huntsman on this project," said Professor Ning Yan and Mohini Sain, Project Leaders, University of Toronto. "The programme has many parallels with our own corporate research and development (R&D) strategy. We are committed to developing renewable technologies that increase the natural content in our products and provide cost effective solutions for our customers. This is a great opportunity to turn forest residue into valuable commercial products. We look forward to sharing our knowledge and exploring new avenues in polyurethane chemistry," said Niek van Wiechen, Global CoreScience Director, Huntsman Polyurethanes. Researchers have discovered a new carbon based material for supercapacitor electrodes which could allow them to store the same amount of energy as a lead-acid battery but with much faster charge times. LONDON, UNITED KINGDOM: A new carbon based material for supercapacitor electrodes could allow them to store the same amount of energy as a lead-acid battery but with much faster charge times. The porous material shows power densities an order of magnitude better than current carbon supercapacitors and can be made in a simple method that could be easily scaled to industrial quantities. "Frankly what happened was a big surprise," said Rodney Ruoff, who developed the material with colleagues at the University of Texas at Austin, US. The group used a 'cookbook' recipe for activating carbon using potassium hydroxide. Whereas industry uses biomass like coconut shells, Ruoff used graphite oxide. "What we expected to happen was to just have holes running through the structure. 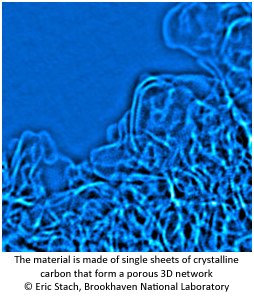 But what happened was the potassium hydroxide restructured the carbon that we started with to make a three dimensional porous network," said Ruoff. Ruoff admits he doesn't know how the potassium hydroxide manages this trick and said it'll be really interesting to find out. If too much KOH is added then all the carbon reacts to form potassium carbonate, but when less is used, it re-arranges the layers of carbon to give a continuous microporous structure. Once the lab realised they had a material with such a high surface area, said Ruoff, they decided to try it in their supercapacitor research, "And it was really good." "Ruoff has shown a simple and powerful new method for cost-effectively producing an ideal electrode material," said Liming Dai, who works on activated carbon electrodes at the University of Dayton, US. He also said that work may well have a much broader scope for synthesising other novel 3D graphene-based structures that could soon be commercialised. What Ruoff said he is particularly excited by is the fact that the material works best with ionic liquid-based electrolytes. The team estimate that a packaged device using this new electrode material could have an energy density similar to the lead-acid batteries used in cars. Ruoff said he doesn't think, the material is optimised yet and he hopes that he'll be joined by other scientists to investigate and further improve it. The study shows that distinct regimes of CO2 transport may occur in deep saline rock formations. Depending on the reaction, CO2 will remain near the top of the reservoir or will spread from the top throughout the depth of the aquifer. CAMBRIDGE, UNITED KINGDOM: Even a simple chemical reaction can delay or prevent the spreading of carbon dioxide stored in underground aquifers, according to new research done by the Department's Fluids and Environment Group. The study shows that distinct regimes of CO2 transport may occur in deep saline rock formations, depending on the strength of the reaction between dissolved CO2 and porous rock. With strong reactions, the CO2 remains near the top of the reservoir, while with weaker ones, the CO2 will spread from the top throughout the depth of the aquifer. "If one knows the physical and chemical properties of the aquifer, one can calculate the movement of CO2 across it and when it will begin to mix with the brine," said Jeanne Therese Andres, a Schlumberger Foundation PhD candidate. Reaction strengths can vary significantly among deep saline reservoirs - rock formations possess a wide range of chemical reaction rates depending on the mineralogy (eg calcite, dolomite etc) as well as other factors such as temperature and pressure. "In theory, one can manipulate the strength of reactions. Thereby engineering the movement of CO2 - keeping it in one area or moving it to another within the aquifer - to enhance its storage underground," said Andres. The researchers established that the basic interaction between fluid flow and chemical kinetics in a deep porous medium is governed by a single dimensionless number, which measures the rate of diffusion and reaction compared to that of natural convection. The work demonstrates how this new parameter controls CO2 flow and mixing in briny porous rock. Through numerical simulations, the researchers found that above this parameter's critical value, reaction stabilizes the CO2 system and convection no longer occurs. Below the parameter's critical value, stronger reactions result in longer delays in the onset of convective mixing throughout the reservoir. For systems with similar convective mixing strengths, stronger reactions, indicated by rising values of the new parameter, can increase the rate at which pure, lighter CO2 dissolves into the brine, enhancing storage and reducing the risk of leakage. "Such knowledge will be valuable in guiding future approaches to carbon storage," said Project Leader, Dr Silvana Cardoso, Reader in Fluid Mechanics and the Environment. Researchers at Hewlett Packard and the University of California, Santa Barbara, have analysed in unprecedented detail the physical and chemical properties of an electronic device that computer engineers hope will transform computing. SANTA BARBARA, US: Memristors, short for memory resistors, are a newly understood circuit element for the development of electronics and have inspired experts to seek ways of mimicking the behaviour of our own brains' activity inside a computer. Research, published in IOP Publishing's Nanotechnology, explains how the researchers have used highly focused x-rays to map out the nanoscale physical and chemical properties of these electronic devices. It is thought memristors, with the ability to 'remember' the total electronic charge that passes through them, will be of greatest benefit when they can act like synapses within electronic circuits, mimicking the complex network of neurons present in the brain, enabling our own ability to perceive, think and remember. Mimicking biological synapses - the junctions between two neurons where information is transmitted in our brains - could lead to a wide range of novel applications, including semi-autonomous robots, if complex networks of neurons can be reproduced in an artificial system. In order for the huge potential of memristors to be utilised, researchers first need to understand the physical processes that occur within the memristors at a very small scale. Memristors have a very simple structure - often just a thin film made of titanium dioxide between two metal electrodes - and have been extensively studied in terms of their electrical properties. For the first time, researchers have been able to non-destructively study the physical properties of memristors allowing for a more detailed insight into the chemistry and structure changes that occur when the device is operating. The researchers were able to study the exact channel where the resistance switching of memristors occurs by using a combination of techniques. They used highly focused x-rays to locate and image the approximately one hundred nanometer wide channel where the switching of resistance takes place, which could then be fed into a mathematical model of how the memristor heats up. "One of the biggest hurdles in using these devices is understanding how they work: the microscopic picture for how they undergo such tremendous and reversible change in resistance. We now have a direct picture for the thermal profile that is highly localized around this channel during electrical operation and is likely to play a large role in accelerating the physics driving the memristive behaviour," said John Paul Strachan, nanoElectronics Research Group, Hewlett-Packard Labs, California. This research appears as part of a special issue on non-volatile memory based on nanostructures. Supporting the International Year Of Chemistry, 2011, on February 10, 2011, Thomson Reuters released data identifying the world's top 100 chemists over the past 10 years as ranked by the impact of their published research. The top 100 is intended to celebrate the achievements of chemists who achieved highest citation impact scores for chemistry papers (articles and reviews) published since January 2000. Citation impact (citations per paper) is a weighted measure of influence that seeks to reveal consistently superior performance. To ensure that a high score could not be achieved by a few highly cited papers, a threshold of 50 papers was used in the analysis. Since approximately a million chemists were recorded in the journal publications indexed by Thomson Reuters during the last decade, these 100 represent the top hundredth of one per cent. Sixteen of those listed also ranked in the top 100 by citation impact in materials science, among those who published 25 or more papers in that field during the last decade. Nanotechnology in all its aspects is strongly in evidence when one surveys the research interests of the chemists listed. While the rubric covers much and some skeptics call "nano" the latest fad in chemistry, there is no denying the message of the citation indicators. The field has attracted enormous interest during the last decade. Of the 100, 60 of these chemists identify nanotechnology as their main focus or a significant research topic. The national affiliations of the authors are: 70 for the United States, seven for Germany, four for the United Kingdom, two each for Canada, France, Denmark, Switzerland, and South Korea and one apiece for Australia, Belgium, Sweden, Italy, Israel, South Africa, Brazil, Japan and Singapore. The institutions appearing three or more times are: Massachusetts Institute of Technology (6), The Scripps Research Institute (5), University of California Berkeley (5), Harvard University (4), Rice University (4), Northwestern University (4), California Institute of Technology (3), University of California Riverside (3) and University of Chicago (3). Ranks in materials science [MS] are noted beneath ranks in chemistry.